APEC Water CS-2500 system delivers high quality Filtered water at an affordable price. This easy to install under the sink water filtration system is made from high quality components and filter media to offer exceptional contaminant rejection rate, while providing long-lasting, reliable performance. This premium quality filter can last up to 12 months with fewer filter change out (filter life may vary depends on water quality), plus easy twist off connection that makes filter replacement a breeze. Assembled in the USA, the CS-2500 provide you and your family with high quality, refreshing clean water with trouble-free maintenance for many years to come. APEC Water Systems does not distribute or sell our products to any 3rd party sellers on Amazon. 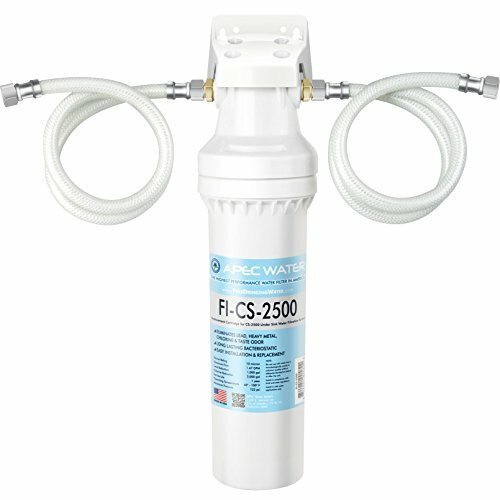 Please purchase genuine APEC Water System product in "New" condition from Amazon.com or APEC Water directly for authenticity. Manufacture warranty may not apply in all cases, depending on factors such as use of product, where the product was purchased, or whom you purchased the product from. Please review the warranty carefully and contact APEC if you have any question. Supreme quality - designed and assembled in USA with US made filter, highest trustful filtration capacity of similar products. Removing lead, chlorine, heavy metals, taste, odor and chemicals while leaving various minerals, like calcium, potassium, and magnesium. Bacteriostatic for the reduction of heterotropic bacteria. Trouble-free installation - comes with standard 3/8" hoses that connect directly to the existing cold water valve and faucet stem, requiring no holes to drill. Quick twist connection design for easy filter replacement. Provide clean and purified water from your existing kitchen faucet therefore do not need a separate faucet or inlet valve. Good for cooking, washing fruits & vegs and cleaning dishes without watermarks. High flow low restriction design to support maximum 1.67 GPM (6.321 LPM) flow rate. Life time tech. support by certified WQA water specialist based in CA. If you have any questions about this product by APEC WATER, contact us by completing and submitting the form below. If you are looking for a specif part number, please include it with your message.